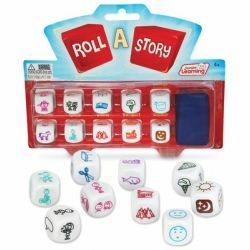 Help children develop story telling and oral language with Roll A Story dice. Simply roll the dice and let the pictures guide children's imagination. How to Play: 1. Roll the dice and look at pictures face up. 2. Group dice together that are related. 3. Choose the dice you want to use and the best dice to start your story. Categories include: people, animals, food, places, transport, feelings, weather, actions, sports, objects. Contains 10 picture dice and 1 carry sack. Ages 4-9, Grades K-4 WARNING: CHOKING HAZARD - SMALL PARTS. Not for children under 3 yrs.